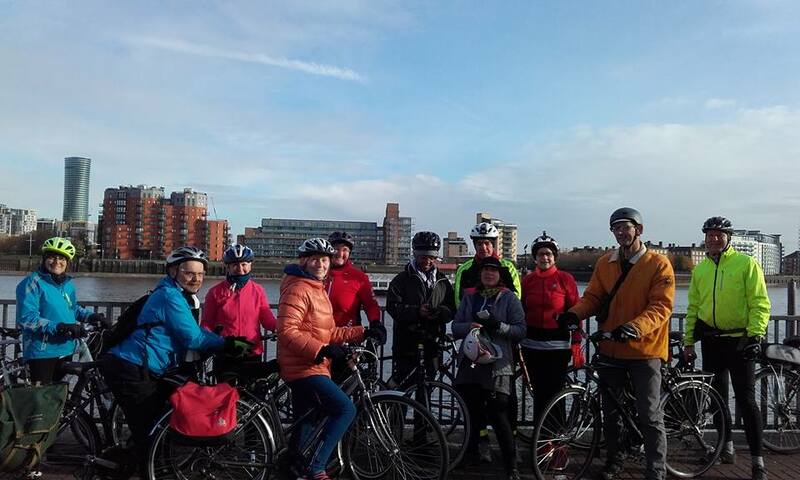 This report of our leisurely 20 miler around South London comes from one of our riders, Debbie. The morning was chilly but bright as 12 of us gathered at the Delice and we soon headed off through Ladywell Fields visiting the first of nine of some of South London’s finest green spaces. Autumn was still clinging on and the trees provided a warm, dappled canopy leaving space for the watery sun to illuminate carpets of freshly fallen crimson, orange and gold leaves. Our ride took in Peckham Rye, Dulwich and Brockwell Parks where our number increased to lucky thirteen when we were joined by a friend of Tim’s. A few slopes ensured that I appreciated the ride from the rear (thanks Tim, excellent backmarker, for your patience!) and I could see from my viewpoint that everyone was enjoying the company, the chatter and the beautiful autumn sunshine, as was I. A quick coffee stop on Clapham Common and then on to Myatt’s Field, Burgess and Southwark Parks, round Surrey Quays, boat filled docks and a bit of the Thames Path before reaching Greenwich. People started to peel off at this point and we were nearly home and dried when a sneaky bollard leapt out in front of one of our group who took a bit of a tumble, but fortunately with no serious damage done. A quick last leg down the Waterlink Way, taking in Brookmill Park, brought us back to the Delice. Many thanks to Jane for leading a lovely ride and for expertly keeping us safe on the few bits of busy road, to Tim for back marking, to all the group for being great company, and last but not least to all the courteous and patient car drivers we encountered today.